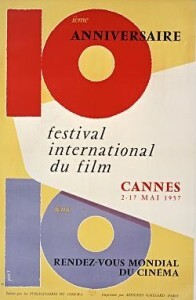 The 10th Cannes Film Festival was held from 2 to 17 May 1957. The Palme d'Or went to the Friendly Persuasion by William Wyler. The festival opened with Around the World in 80 Days by Michael Anderson. During the 1957 Cannes Film Festival, Dolores del Río was the first female member of the jury for the official selection. ^ "Posters 1957". festival-cannes.fr. Archived from the original on 26 December 2013. ^ a b "Awards 1957: All Awards". cinema-francais.fr. Archived from the original on 25 December 2013. ^ a b c d "Official Selection 1957: All the Selection". cinema-francais.fr. Archived from the original on 26 December 2013. ^ "1957 - La Loi de Cannes (The Law of Cannes)". cannes-fest.com. Retrieved 25 May 2017. ^ a b "10ème Festival International du Film - Cannes". cinema-francais.fr (in French). Retrieved 6 June 2017. ^ "Retro Cannes". mirror.co.uk. Retrieved 25 May 2017. ^ "Honoring the Female Trailblazers of Cannes /2. Dolores del Río". harpersbazaar.com. Retrieved 6 July 2017. ^ "Le Jury, Les Prix 1957". festival-cannes.fr. Archived from the original on 4 March 2016. ^ "Cannes Film Festival Awards for 1957". imdb.com. Retrieved 4 July 2017.